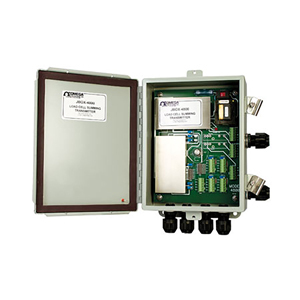 The JBOX-4800 is an ac or dc powered summing transmitter for up to four load cells with user selectable output options of 0-20 mA, 4-20 mA, 0-10 Vdc or 2-10 Vdc. The JBOX has built-in excitation supply capable of delivering up to 120 mA from 5 Vdc to 10 Vdc. 3-way isolation is standard; input to output and power. Designed with industrial weighing applications in mind, a large tare offset is standard (80% of a 3 mV signal @ 10 V excitation). The board is wired and socketed for high and low setpoint/alarms. To activate, the user buys the relays and plugs them in.